A motoring enthusiast broke one long-standing speed record but was forced to postpone another on Saturday. Zef Eisenberg had already broken the sand speed record on a motorbike and added the flying mile record at 182mph (293km/h). But his attempts to top 200mph in a car on Pendine Sands, Carmarthenshire, were scuppered after engine and tyre issues on his motorbike delayed the run. He will return in May to attempt the car record. 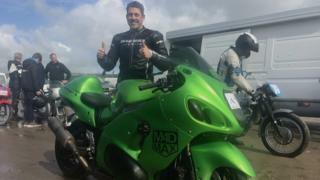 Mr Eisenberg, who founded fitness company Maximuscle, previously held the top speed record on sand on a motorbike, reaching 201.5mph on his 400bhp Suzuki Hayabusa at Pendine Sands last year. On Saturday, he broke another record, averaging 182.4mph over two miles on the beach, beating the 1927 record set in the iconic Blue Bird by Sir Malcolm Campbell of 174mph and actor Idris Elba's 2015 effort. A flying mile takes the average speed over two mile-long runs, with a mile to get up to speed. 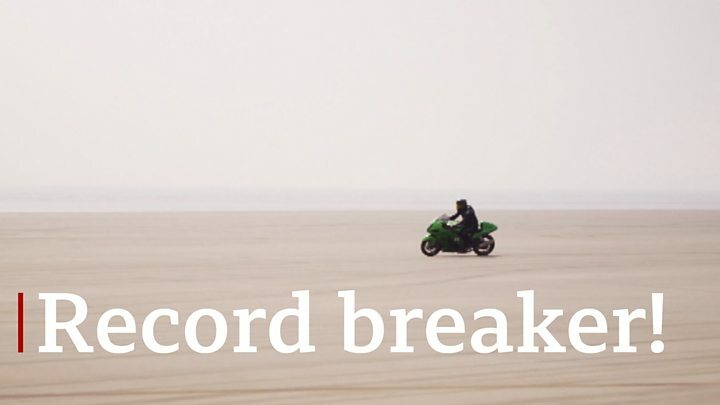 But any further record attempts were scuppered after the motorbike suffered an engine blowout at 195mph and its rear tyre started to wear, leaving him no time to attempt the speed record in his bespoke Porsche 911 Turbo S after checks and repairs to the sand were carried out. He will make another attempt in the Porsche on the weekend of the 18 May. Speaking ahead of the attempt, businessman Mr Eisenberg said he was inspired by someone asking what was next after his successful motorbike attempt last year. "That's not good to say to someone like me and I thought let's get the outright sand record for a car and a bike," he said. "When you try something that no-one has done before, there is some trepidation and fear. The car has a roll cage and I wear all the protection you can buy, but if the wheel sticks in the sand and the car flips 360 degrees, it could be game over."